Disney's ongoing modern renaissance reached new heights once more with the release of Zootopia earlier this year, and while it's opening box office figures may not be as colossal as the studio's biggest hits, the fantasy adventure Moana looks poised to continue such success without difficulty. 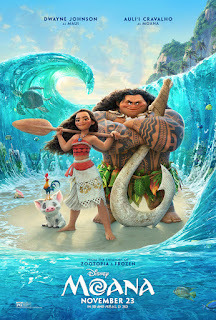 Directed by Disney icons John Musker and Ron Clements (The Little Mermaid, Aladdin, Hercules), this latest animated hit tells the story of the eponymous princess (Auli'i Cravalho) and her journey across the ocean alongside the demigod Maui (Dwayne Johnson), after being chosen for an important mission by the sea itself before the incoming darkness dominates her homeland and everywhere around it. 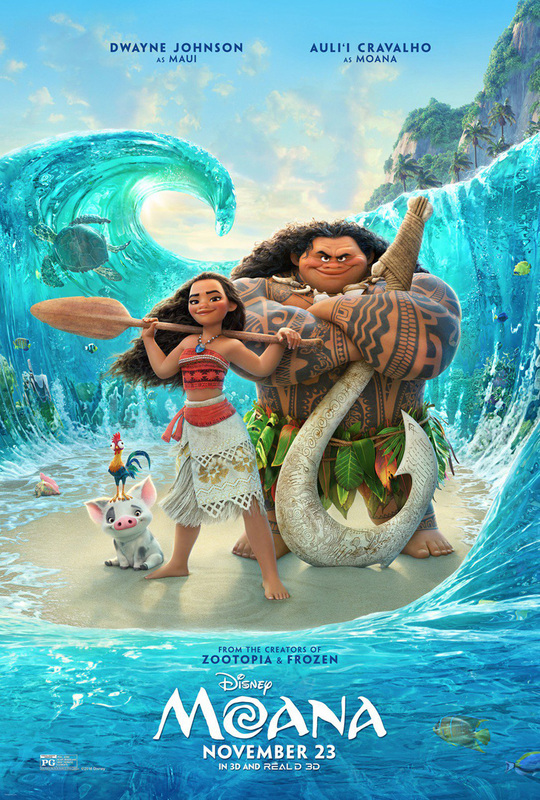 Moana feels like a traditional Disney film from the get go but with the addition of modern animated trademarks - mainly in terms of it's humour and visual style, the latter of course is most evident as a key highlight. The animation is truly beautiful throughout, displaying a number of remarkable lighting techniques in the oceanic sequences, both in the night and day, which yields some truly stunning end results. Characters remain as fluently animated and lively designed as ever - you'd expect nothing less from Disney at this stage, and they certainly stay true to their reputation here. The same impact is also felt when it comes to music - the songs we'll get to later, but it has to be said that the score by Mark Mancina (Tarzan, Brother Bear) among other snippits of music by other contributors (namely the short intro by Olivia Foa'i) help further cement viewers in the atmosphere of this beautifully crafted setting. When it comes to the overall story, Moana is generally exciting and engaging, and it's admirable that it manages to keep us hooked throughout despite some limitations within it's setting and cast. Moana herself is one of Disney's most well fleshed out protagonists, and it's clear plenty of effort was made to make her more diverse from past Disney princesses - she's funny, courageous, relatable in some ways, and her chemistry with Maui is generally well developed; the two not only share a number of hilarious comedic sequences but also form a visible emotional bond as the story goes on that feels natural and realistic, in spite of some contrivances and random moments. While Dwayne Johnson's vocal performance is without a doubt funny, passionate, and very entertaining, it's the performance from 16 year old Auli'i Cravalho that will win over most audiences - not only when it comes to general acting but especially her singing. The majority of the songs themselves are just as memorable as they are enjoyable, but the singing performance by Cravalho are most notably vibrant and incredibly passionate, making the primary How Far I'll Go the movie's best song by a mile for sure. Whilst the narrative is great for the most part, it of course can't be without flaws - these occur when it comes to moments of pacing and general plot development, and are mainly linked to Maui himself. Whilst he is likeable to watch and brilliantly voiced by Dwayne Johnson once again, his backstory isn't as fleshed out as it should be, thus making certain revelations about his overall character arc a little underwhelming and somewhat generic - similar things can be said for some last minute contrivances as we near the film's climax, though these don't have so much of a negative impact. In spite of this, there is much to enjoy in Disney's latest release when it comes to all the key categories - from visuals to music to humour to overall storytelling. Said disappointing flaws can be frustrating given the potential they have stripped away in some sections, but Moana remains another thoroughly enjoyable hit from the house of mouse that once again proves they have still not lost any of their magic.